The first few S.T.A.L.K.E.R. titles were frightening open-world goodness for the PC, but the now officially announced sequel could go multi-platform. 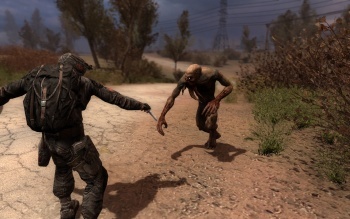 GSC Game World has officially revealed that it's working on S.T.A.L.K.E.R. 2, a sequel to the trilogy of S.T.A.L.K.E.R. games already released for the PC. Thought the announcement comes with little information, rumors of a console version took one step closer to reality. In addition to saying that GSC is currently hard at work on S.T.A.L.K.E.R. 2, the company said it's creating "a completely new multi-platform technology" for the "core of the game." Dubbing the S.T.A.L.K.E.R. sequel's technology base "multi-platform" indicates that GSC is at least considering the sequel for release on consoles, which would no doubt increase the series' visibility amongst gamers. The three games in the S.T.A.L.K.E.R. series were exclusively developed for the PC and with good reason: They're gigantic beasts of challenging, free-roaming gameplay that take place in a nuclear wasteland where death can come at a moment's notice from any number of horrifying and painful directions. If you decide to attack one of the games' NPCs, his crew could decide to come hunt you down at your camp or you could piss off an entire faction that will no longer be friendly. Or you can just sit down at a campfire and listen to a friend play the acoustic guitar. The series is sort of like Fallout 3, but somewhat less friendly to players, other than the guitar playing. GSC calls S.T.A.L.K.E.R. 2 "the next chapter of the mega-popular game players expect from us" and reveals that the company has sold more than 4 million copies of the S.T.A.L.K.E.R. games worldwide. S.T.A.L.K.E.R. 2 won't be released until 2012, and though only a PC release is assured right now, don't be surprised if a version of the game hits consoles too.